I'm not someone who categorically opposes putting "the bad guys" on the front page of a newspaper or on the cover of a magazine. After a tragic terrorist attack or heinous mass murder, there are often well-intentioned admonishments that doing so only satisfies the killer's "craving for attention," a pat motivation we somewhat overstate. I appreciate that sentiment, but I don't always share it. The important news of the day is the important news of the day, whether we like the face and name most strongly associated with it or not. Besides, to report is not to approve and to publicize is not necessarily to glamorize. There is a big difference between fame and infamy, and if the world has come to conflate the two, then that is a problem with our culture's morality, not its media. That said, context and presentation matter. There are good reasons why it may feel acceptable to run a solo photo of a terrorist on, say, the cover of TIME magazine, but not amid star-studded company on the entertainment world's equivalent of a Wheaties box. Which is what we saw last night when Rolling Stone unveiled its August cover (seen here), which features accused Boston Marathon bomber Dzhokhar Tsarnaev in a design treatment reminiscent of a rock idol, not a man associated with a three months-old terrorist attack. The cover choice is tacky and tasteless. And the decision to be so was deliberate. This isn't the result of poor judgment or an art director mentally asleep at the wheel. It's a transparent, cynical attempt by Rolling Stone to reassert its dusty but fabled brand as once-again "edgy" and "counterculture" by appealing to "false flag! "-wailing college conspiracy theorists and Tsarnaev The Puppy-Eyed Prisoner fangirls. "Hey, maybe we still have a chance with kids that age!" yelped the marketing department at Rolling Stone, a magazine that lost much of its relevance and cultural cache in the '90s with then-new readers my age: too young to have witnessed its glory days as a music mag, old enough to have experienced it as just-another mainstream glossy that featured Britney Spears with a Teletubby. 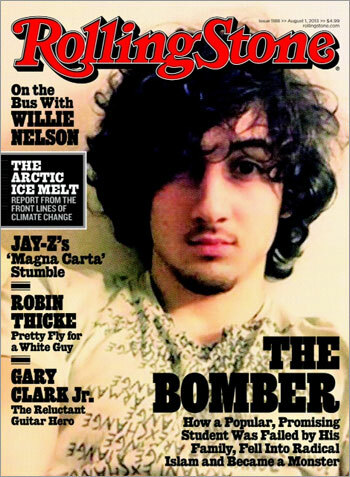 What's offensive is not the fact that Rolling Stone put Tsarnaev on its cover. It's the way they did it. First, the photo. Yes, Rolling Stone has always covered politics and current events, and Tsarnaev isn't even the first (obligatory: "alleged") murderer to grace its cover. 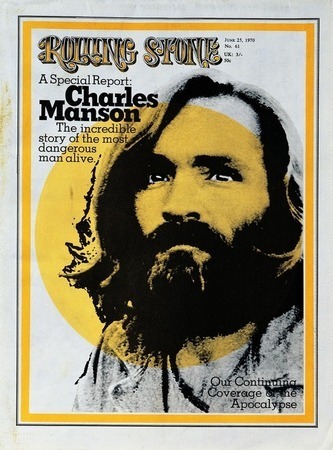 (It even ran an award-winning 1970 prison interview with Charles Manson.) But of all the available images of Tsarnaev, and of all the ways to present them, they seemed to choose the one that most closely resembles a teen idol's publicity photo. Trendy t-shirt! Tousled hair! Brightened eyes cocked in that totes-casual OH HAIIIII pose that the kidz strike for Instagram selfies! It's all there but the acoustic guitar, and though Rolling Stone can't change the way Tsarnaev looks, they can certainly control whether they choose-zoom-crop-edit his photo to maximize presentation of him as a Jonas Brother by way of Jim Morrison. Rolling Stone defenders will inevitably point out that this photo of Tsarnaev has been used elsewhere too, even on the front page of The New York Times. (Though not in full-bleed, pin up-ready glory.) But here, again, is where context counts. On the front page of a paper like the Times, where the photo was accompanied by the headline, "The Dark Side, Carefully Masked" and sandwiched between hard hitting updates about immigration reform and Syria, the intent of the image was clear: to underscore the chilling incongruity between an ordinary-looking kid and his extraordinarily cruel crime. 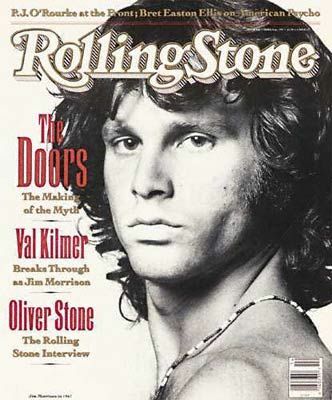 But by placing him on the cover of Rolling Stone, where photos of foppish, blasÃ© young dudes appear all the time, the magazine only stresses a sense of ordinariness, spiked with a whiff of irresponsible adulation: look how easily, how coolly, he fits in on a magazine cover. And look at the other names on it! Groovy grandpa pothead Willie Nelson! Billboard number one crooner Robin Thicke! DA MAN Jay-Z! Fresh off Glastonbury Festival, bluesy wunderkind Gary Clarke Jr.! And then, lumped alongside them in the very same, bold-faced breath, The Bomber: endowed on Tsarnaev like it's some career-defining stage moniker, a la "The Gloved One " or "The Material Girl." Notice that the only other non-entertainment headline, a climate change report, is offset in a distinct black box. Ooh. Different. Special Report. Quite grave. But not Tsarnaev, he's folded into the same design plane as the other "stars." Why does it seem that Rolling Stone is not just reporting on Tsarnaev, but glamorizing him? Gee, maybe because they have chosen to so seamlessly package him as a fit-for-framing dorm poster. You have an insightful, thoughtfully-reported cover story on a major news figure? One responsible for death, dismemberment, and still-fresh emotional wounds? Fine. That's important. Run it, maybe even on the cover. But present the subject in a manner that befits the gravity of the story: not like he's the top billed act on a Bonnaroo flyer. The thing is, there's a very good chance that the feature itself will be an interesting, even insightful one. This short preview suggests revelations about Tsarnaev's disintegrating family and growing religiosity, and his older brother Tamerlans's increasingly disturbed mental state. ("Jahar's older brother Tamerlan confided to his mother that he felt like 'two people' were inside him," Rolling Stone reports.) There's a difference between excuses and explanations, and we do everyone, especially victims, a disservice when we dismiss the need to understand why once-promising people do horrible, horrible things. But when considered alongside its Cool Cat-connoting cover image, I wonder whether the intent isn't just to cash in on the uber zeitgeist-y, youth-skewing contrarianism around his culpability. The subhead under Tsarnaev's photo reads, "How a popular, promising student was failed by his family, fell into radical Islam and became a monster." That language is a shiny gift to a crowd of buck-passing Tsarnaev fans and courthouse protestors who, between rounds of beer pong and waxing philosophical about their eye-opening semester abroad, have managed to convince themselves that Tsarnaev is a railroaded victim of circumstance who deserves not just begrudgingly granted understanding of his condition, but full exoneration and a big squishy hug. ("He was failed by his family - Ugh! Like, me too! - and The System!") Lest there be any uncertainty that the magazine is courting that demographic, it's interesting that the Rolling Stone synopsis refers to its cover boy not by his given first name, Dzhokhar, as most news stories do. Rather, they choose to go with Jahar Tsarnaev, using the friendly nickname co-opted by the social media-fueled #FreeJahar "movement." What does that communicate? Never mind. The cover picture already said a thousand words. What it sorely needed, though, was just one brave editor who was willing to say: "No."